In the catalog of impressive birthdays, yesterday stands strong. The celebration started the prior evening. Snug in my normal place in the kitchen of the Dolphin house, I speared caramelized plantains from a common plate, a birthday treat from Kyle, an artist/songwriter lingering at Pigeon Point between stages of his journey. The conversation flowed around me. i made occasional interjections and laughed at some of the funniest unintentional one-liners that I’ve heard in a Hunter’s moon. I meant to photograph sunrise on my birthday, but the low mist clinging to the sea impeded the task. Instead I started a pot of coffee and assumed my spot with a view of the ocean to the west. I watch the light slowly rise across the endless expanse of the sea. One by one the resident tribe emerged from the dorm rooms. Some accepted my offer of coffee. Others made their tea. A woman working as a substitute teacher in Half Moon Bay slipped away before anyone but me had awoken. I watched her form pass by the window, my heart heavy with the knowledge that she bore a shroud of sorrow on her narrow shoulders. Then the noise started. Jung from China, Genevieve from Australia, Rosario from Sicily by way of New York, Devon from Vancouver, Marc from Switzerland, Lauren from Houston — each of them with a different drive that brought them to this way stop. Fruit fell into bowls; eggs onto plates. Plans began to emerge. People disclosed their departure times and exchanged e-mails. Devon brought out a game which he acknowledged inventing. 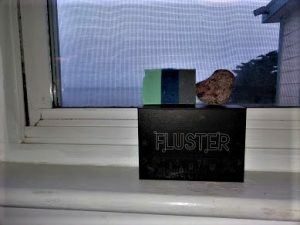 Intrigued, we opened the box of Fluster and began learning more about each other. Pledging to honestly answer the questions posed by each card, we let our defenses slip as travelers do in the anonymous realms — hostels, hotels, the Internet. Our revelations weakened our facades as they strengthened our connections. We determined that more rounds would be needed — but in the evening, over glasses of contraband wine in the comfort of Dolphin’s living room. 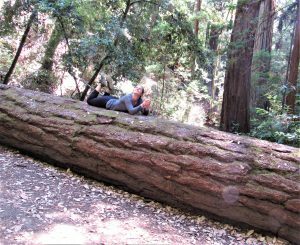 Genevieve mentioned that she intended to see redwoods. As I had the same journey in mind, we joined forces. We compiled a cooler of assorted food and set off for the woods above Pescadero. The sensation of walking among ancient trees and sharing the events of one’s life with someone whom one does not know has no compare. By the end of the afternoon, I had acquired a friend. We ate our lunch straddling a fallen tree, feeding broccoli to a squirrel in accidental defiance of the anti-crumb rule. The squirrel did not seem to mind. We came down from the mountain and spent an hilarious hour looking for Gen’s keys in the hostel parking lot. A few minutes after the AAA guy had opened her car, the keys materialized in my little bag. Then the young folks grouped around the campfire, spent an hour in the hot tub under the stars, and gathered back in the kitchen. We adjourned to the couches and opened the box of cards. Questions got asked. Disclosures eased from one or the other of the company. Revelations stilled us and drew gasps. We murmured our understanding. We interjected our agreement or dispute. Genevieve identified her superpower as being able to identify someone by the sight of their hands, and we tested her ability. She proved herself to our great delight. At 11:00, the manager came into the building. He gave mild rebuke for the forbidden fruit of the vine but forgave us when I mentioned the anniversary of my birth. He cautioned us to whisper lest we disturb others. The gathering soon ended. We carried dishes into the kitchen and Devon set himself to washing. 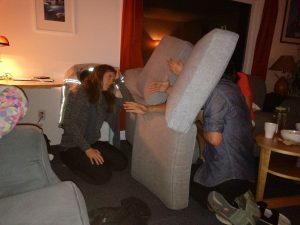 We dispersed to our rooms, and then to our beds. In the female dorm, I spoke with Jacqueline, a late arrival who had not played our game. she told me that her work brought her to California. I asked, of course, what she did. She disclosed that she trained grief counselors and had been retained to help with survivors of the Carr Fire in Redding. I felt a sense of awe which I shared with her. You meet the best people in a hostel. Gen came to the room and we wished each other good night. I shut off the lights, even the red ones provided for sleeping. Quiet descended. Soon the sound of the ocean filled the air. I slid into a happy sleep. It’s the sixth day of the fifty-seventh month of My Year Without Complaining. Life continues. This entry was posted in Uncategorized on 06 September 2018 by ccorleyjd365.